In 2015, faced with the complicated domestic and international environment and the heavy tasks to maintain the development, reform and stability, the Central Party Committee and the State Council have led the people of all nationalities of China, according to the requirements of the overall plan for promoting economic, political, cultural, social and ecological progress and the “Four-Pronged Comprehensive Strategy”, to establish and implement the innovative, coordinated, green, open and shared development concept, adapt to the new normal of economic development, insist on the reform and opening up policy, adhere to the general tone of “making progress while maintaining stability”, stick to “stabilizing growth, adjusting structure, benefiting people’s livelihood and fending off risks”, continuously innovate the macro-regulation guideline and methods, advance the structural reform, push forward the “mass entrepreneurship and innovation” and promote the national economy to maintain medium-to-high speed and move to medium-to-high end. As a result, the transformation and upgrading has fastened, the reform and opening up deepened, people’s livelihood improved and the economic and social development reached a new level, which marks a successful conclusion of “the 12th Five-Year Plan” and has laid down a solid foundation for the economic and social development of “the 13th Five-Year Plan” and for comprehensively building a moderately prosperous society. According to preliminary accounting, the gross domestic product (GDP) in 2015 was 67,670.8 billion yuan, up by 6.9 percent over the previous year. Of this total, the value added of the primary industry was 6,086.3 billion yuan, up by 3.9 percent, that of the secondary industry was 27,427.8 billion yuan, up by 6.0 percent and that of the tertiary industry was 34,156.7 billion yuan, up by 8.3 percent. The value added of the primary industry accounted for 9.0 percent of the GDP, that of the secondary industry accounted for 40.5 percent, and that of the tertiary industry accounted for 50.5 percent, the first time for the tertiary industry to taking up more than 50 percent. 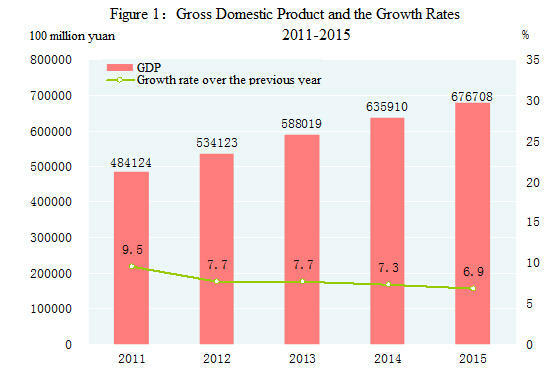 The per capita GDP in 2015 was 49,351 yuan, up by 6.3 percent compared with the previous year. The gross national income in 2015 was 67,302.1 billion yuan. By the end of 2015, the total number of Chinese population at the mainland reached 1,374.62 million, an increase of 6.80 million over that at the end of 2014. Of this total, urban permanent residents numbered 771.16 million, accounting for 56.10 percent of the total population (the urbanization rate of permanent residents), 1.33 percentage points higher than the previous year. The year 2015 saw 16.55 million births, a crude birth rate of 12.07 per thousand, and 9.75 million deaths, or a crude death rate of 7.11 per thousand. The natural growth rate was 4.96 per thousand. The number of population who live in places other than their household registration area reached 294 million, of which 247 million were floating population . The life expectancy was 76.34 years. At the end of 2015, the number of employed people in China was 774.51 million, and that in urban areas was 404.10 million. 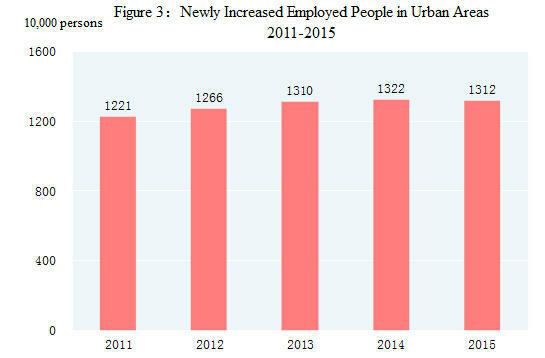 The newly increased employed people in urban areas numbered 13.12 million. The registered urban unemployment rate was 4.05 percent at the year end. The total number of migrant workers in 2015 was 277.47 million, up by 1.3 percent over that of 2014. Of which, the number of migrant workers who left their hometowns and worked in other places was 168.84 million, increased by 0.4 percent, and those who worked in their own localities reached 108.63 million, up by 2.7 percent. 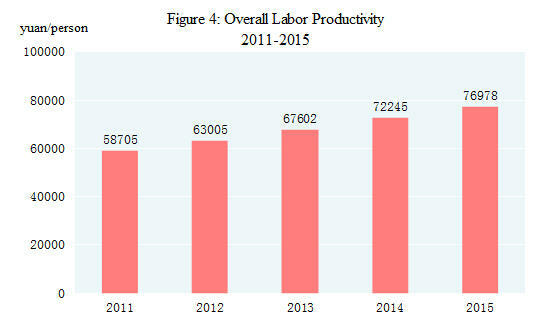 The overall labor productivity was 76，978 yuan per person in 2015, an increase of 6.6 percent compared with that in 2014. 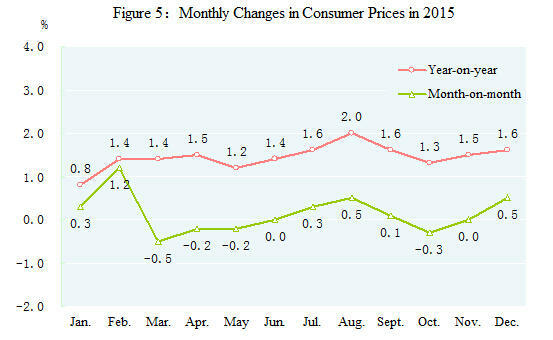 The consumer prices in 2015 went up by 1.4 percent over the previous year. Of this total, the prices for food went up by 2.3 percent. The prices for investment in fixed assets decreased by 1.8 percent. The producer prices went down by 5.2 percent and the purchasing prices for manufactured goods down by 6.1 percent. The producer prices for farm products were up by 1.7 percent. 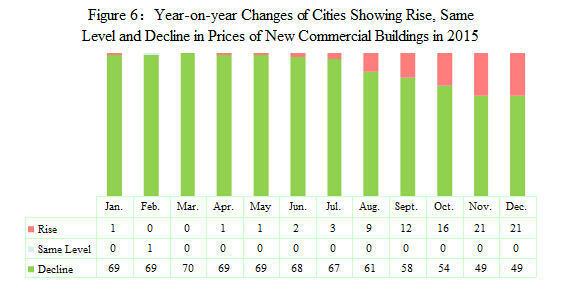 By the end of the year, out of the 70 large-and-medium-sized cities, the number of cities that showed a year-on-year rise in sales prices of new commercial residential buildings was 21, 20 cities more than the beginning of the year; 49 cities experienced a decline, 20 cities less than the beginning of the year. 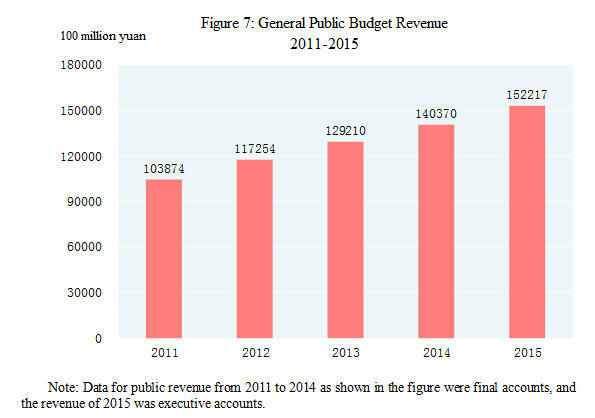 The general public budget revenue reached 15,221.7 billion yuan in 2015, an increase of 832.4 billion yuan or up by 5.8 percent over the indicator of the same coverage in the previous year. Of this total, the taxes collected in the whole year reached 12,489.2 billion yuan, an increase of 571.7 billion yuan or up by 4.8 percent. 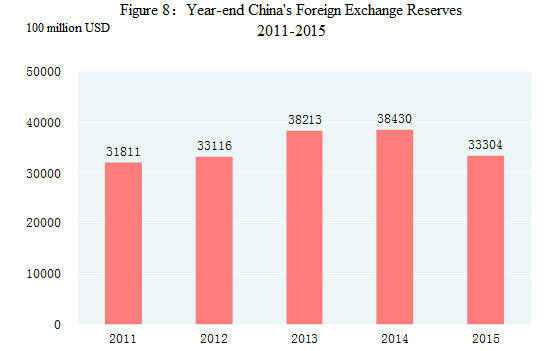 At the end of 2015, China’s foreign exchange reserves reached 3,330.4 billion US dollars, a decrease of 512.7 billion US dollars as compared with that at the end of the pervious year. The average exchange rate of the year was 6.2284 RMB to 1 USD, depreciated by 1.4 percent over that of 2014. In 2015, the sown area of grain was 113.34 million hectares, an increase of 620 thousand hectares compared with that in the previous year; the sown area of cotton was 3.80 million hectares, a decrease of 420 thousand hectares; the sown area of oil-bearing crops was 14.06 million hectares, an increase of 10 thousand hectares; the sown area of sugar crops was 1.74 million hectares, a decrease of 160 thousand hectares. 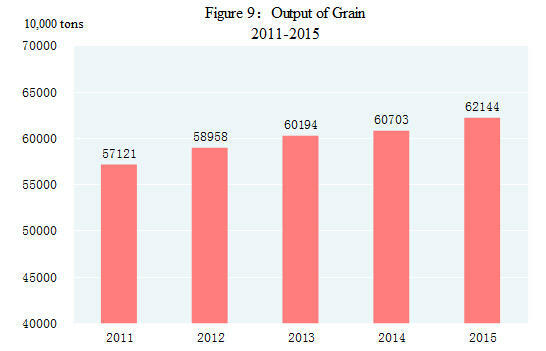 The total output of grain in 2015 was 621.44 million tons, an increase of 14.41 million tons or up by 2.4 percent over the previous year. Of this total, the output of summer crops was 141.12 million tons, increased by 3.3 percent, and that of the early rice was 33.69 million tons, down by 0.9 percent over the previous year. The output of autumn grain was 446.62 million tons, an increase of 2.3 percent. The output of cereal was 572.25 million tons, an increase of 2.7 percent, among which the output of rice was 208.25 million tons, up by 0.8 percent; that of wheat was 130.19 million tons, up by 3.2 percent; and that of corn was 224.58 million tons, up by 4.1 percent. In 2015, the output of cotton was 5.61 million tons, a decrease of 9.3 percent over the previous year, that of oil-bearing crops was 35.47 million tons, an increase of 1.1 percent and that of sugar crops was 125.29 million tons, a decrease of 6.2 percent, and that of tea was 2.24 million tons, up by 6.9 percent. The total output of meat for the year reached 86.25 million tons, down by 1.0 percent over the previous year. Of this total, the output of pork was 54.87 million tons, down by 3.3 percent; that of beef was 7.00 million tons, increased by 1.6 percent; and that of mutton was 4.41 million tons, an increase of 2.9 percent, and that of poultry was 18.26 million tons, an increase of 4.3 percent. The total output of eggs was 29.99 million tons, up by 3.6 percent. The production of milk was 37.55 million tons, up by 0.8 percent. At the end of the year, 451.13 million pigs were registered in the total stocks, down by 3.2 percent, and 708.25 million pigs were slaughtered, down by 3.7 percent. The total output of aquatic products in 2015 was 66.90 million tons, up by 3.5 percent over the previous year. Of this total, the output of cultured aquatic products was 49.42 million tons, up by 4.1 percent; and that of fished aquatic products was 17.48 million tons, up by 0.5 percent over the previous year. The total production of timber for the year 2015 reached 68.32 million cubic meters, a decrease of 17.0 percent compared with the previous year. Over 1.58 million more hectares of farmland were equipped with effective irrigation systems and another additional 2.54 million hectares of farmland was equipped with water-saving irrigation systems. 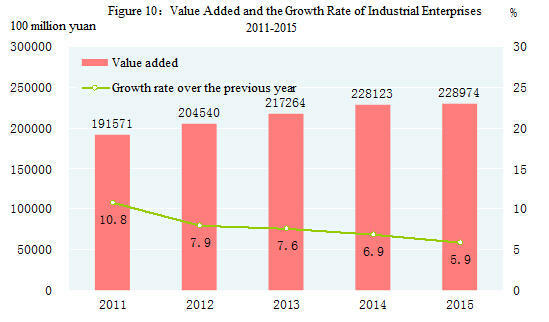 In 2015, the total value added of the industrial sector was 22,897.4 billion yuan, up by 5.9 percent over the previous year. The value added of industrial enterprises above the designated size increased by 6.1 percent. Of the industrial enterprises above the designated size, in terms of ownership, the value added of the state-holding enterprises grew by 1.4 percent, that of the collective enterprises up by 1.2 percent, that of the share-holding enterprises up by 7.3 percent, that of the enterprises by foreign investors and investors from Hong Kong, Macao and Taiwan up by 3.7 percent and that of private enterprises up by 8.6 percent. In terms of sectors, the value added of the mining industry grew by 2.7 percent, that of manufacturing up by 7.0 percent and that of the production and supply of electricity, heat power, gas and water rose by 1.4 percent. In 2015, of the industrial enterprises above the designated size, the value added for processing of food from agricultural products was up by 5.5 percent over the previous year; for textile industry up by 7.0 percent; for manufacture of raw chemical materials and chemical products up by 9.5 percent; for manufacture of non-metallic mineral products up by 6.5 percent, for smelting and pressing of non-ferrous metals up by 5.4 percent; for manufacture of general machinery up by 2.9 percent; for manufacture of special purpose machinery up by 3.4 percent; for manufacture of automobiles up by 6.7 percent; for manufacture of electrical machinery and equipment up by 7.3 percent; for manufacture of computers, communication equipment and other electronic equipment up by 10.5 percent; for production and supply of electricity and heat power up by 0.5 percent. The growth of the value added for the six major high energy consuming industries was 6.3 percent, accounting for 27.8 percent of the value added of industrial enterprises above the designated size. The value added of the high technology manufacturing industry was up by 10.2 percent over the previous year, accounting for 11.8 percent of that of industrial enterprises above the designated size. The value added for manufacturing of equipment was up by 6.8 percent, accounting for 31.8 percent of that of industrial enterprises above the designated size. By the end of 2015, the installed power generation capacity was 1,508.28 million kilowatts, up by 10.5 percent over the end of the previous year, among which the installed thermal power generation capacity was 990.21 million kilowatts, up by 7.8 percent; the installed hydropower generation capacity was 319.37 million kilowatts, up by 4.9 percent; the installed nuclear power generation capacity was 26.08 million kilowatts, up by 29.9 percent. The installed grid-connected wind power generation capacity was 129.34 million kilowatts, up by 33.5 percent and the installed grid-connected solar power generation capacity was 43.18 million kilowatts, an increase of 73.7 percent. The profits made by the industrial enterprises above the designated size in 2015 were 6,355.4 billion yuan, a decrease of 2.3 percent over the previous year. Of this total, the profits of state-holding enterprises were 1,094.4 billion yuan, down by 21.9 percent; those of collective enterprises were 50.8 billion yuan, down by 2.7 percent; those of share-holding enterprises 4,298.1 billion yuan, down by 1.7 percent; those of the enterprises by foreign investors and investors from Hong Kong, Macao and Taiwan 1,572.6 billion yuan, down by 1.5 percent; and those of private enterprises were 2,322.2 billion yuan, a rise of 3.7 percent. In terms of different sectors, the profit of mining was 260.4 billion yuan, down by 58.2 percent compared with the previous year; those of manufacturing 5,560.9 billion yuan, up by 2.8 percent; those of the production and supply of electricity, heat power, gas and water 534.1 billion yuan, up by 13.5 percent. 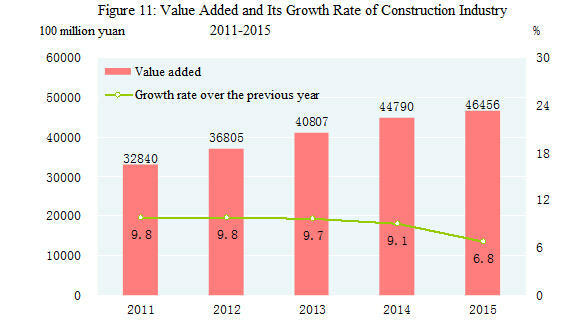 In 2015, the value added of construction enterprises in China was 4,645.6 billion yuan, up by 6.8 percent over the previous year. The profits made by construction enterprises qualified for general contracts and specialized contracts reached 650.8 billion yuan, up by 1.6 percent, of which the profits made by state-holding enterprises were 167.6 billion yuan, up by 6.0 percent. 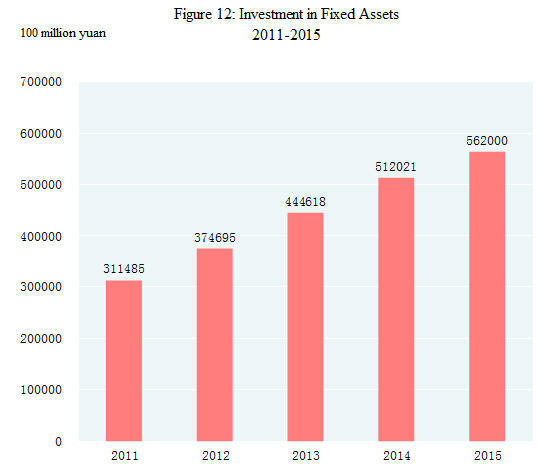 The total investment in fixed assets of the country in 2015 was 56,200.0 billion yuan, up by 9.8 percent over the previous year. The real growth was 11.8 percent after deducting the price factors. Of the total investment, the investment in fixed assets (excluding rural households) was 55,159.0 billon yuan, up by 10.0 percent. By regions , the investment in eastern areas was 23,210.7 billion yuan, up by 12.4 percent over the previous year, in central areas 14,311.8 billion yuan, a growth of 15.2 percent, in western areas 14,041.6 billion yuan, a growth of 8.7 percent, and in northeastern areas 4,080.6 billion yuan, down by 11.1 percent. In the investment in fixed assets (excluding rural households), the investment in the primary industry was 1,556.1 billion yuan, up by 31.8 percent; that in the secondary industry was 22,409.0 billion yuan, up by 8.0 percent; and that in the tertiary industry was 31,193.9 billion yuan, up by 10.6 percent. 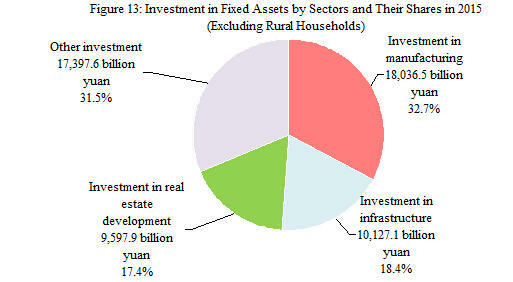 The investment in infrastructure was 10,127.1 billion yuan, up by 17.2 percent, accounting for 18.4 percent of the investment in fixed assets (excluding rural households). The private investment in fixed assets was 35,400.7 billion yuan, an increase of 10.1 percent, accounting for 64.2 percent of the total investment in fixed assets (excluding rural households). The investment in high technology industries was 3,259.8 billion yuan, up by 17.0 percent, accounting for 5.9 percent of the total investment in fixed assets (excluding rural households). In 2015, the investment in real estate development was 9,597.9 billion yuan, up by 1.0 percent. Of this total, the investment in residential buildings reached 6,459.5 billion yuan, an increase of 0.4 percent, that in office buildings was 621.0 billion yuan, up by 10.1 percent, and that in buildings for commercial business was 1,460.7 billion yuan, up by 1.8 percent. In 2015, 7.72 million apartments under the national urban affordable housing projects were completed and 7.83 million were newly started, among which 6.01 million were of shantytown renovation. 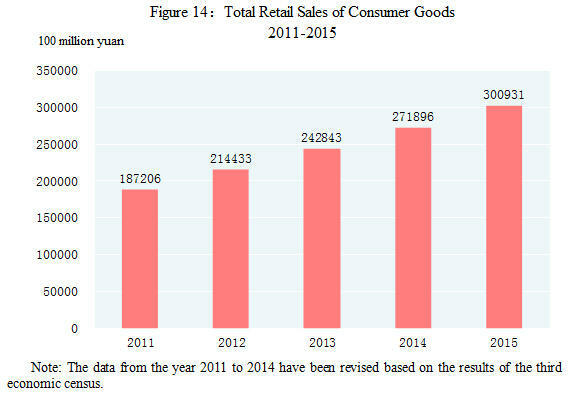 In 2015, the total retail sales of consumer goods reached 30,093.1 billion yuan, a growth of 10.7 percent over the previous year, or a real growth of 10.6 percent after deducting price factors. An analysis on different areas showed that the retail sales of consumer goods in urban areas stood at 25,899.9 billion yuan, up by 10.5 percent, and that in rural areas reached 4,193.2 billion yuan, up by 11.8 percent. Grouped by consumption patterns, the retail sales of commodities was 26,862.1 billion yuan, up by 10.6 percent, and that of catering industry was 3,231.0 billion yuan, up by 11.7 percent. The online retail sales were 3,877.3 billion yuan in 2015, an increase of 33.3 percent compared with the previous year. The online retail sales of commodities were 3,242.4 billion yuan, an increase of 31.6 percent. Among online retail sales of commodities, the sales of food increased by 40.8 percent, clothing by 21.4 percent and daily necessities by 36 percent. The total value of imports and exports of goods in 2015 reached 24,574.1 billion yuan, down by 7.0 percent over the previous year. Of this total, the value of goods exported was 14,125.5 billion yuan, down by 1.8 percent, and the value of goods imported was 10,448.5 billion yuan, down by 13.2 percent. The balance of imports and exports (exports minus imports) was 3,677.0 billion yuan, an increase of 1,324.4 billion yuan over the previous year. 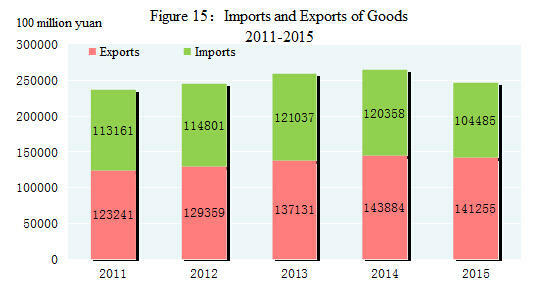 The total value of imports and exports of services in 2015 was 713.0 billion US dollars, up by 14.6 percent. The export value of services was 288.2 billion US dollars, up by 9.2 percent. The import value of services was 424.8 billion US dollars, up by 18.6 percent. The deficit of exports minus imports of services was 136.6 billion US dollars. The year 2015 witnessed the establishment of 26,575 enterprises (excluding banking, securities and insurance) with foreign direct investment, up by 11.8 percent over the previous year; and the foreign capital actually utilized was 781.4 billion yuan (126.3 billion US dollars), up by 6.4 percent. Among the enterprises, 2,164 of them were invested by investors from countries along the Belt and Road , up by 18.3 percent; and the foreign capital actually utilized was 52.6 billion yuan (8.5 billon US dollars), an increase of 25.3 percent. In 2015, the overseas direct investment (excluding banking, securities and insurance) by Chinese investors was 735.1 billion yuan, or 118.0 billion US dollars, up by 14.7 percent over the previous year. Among the investment, Chinese investors directly invested 14.8 billion US dollars in countries along the Belt and Road, an increase of 18.2 percent. In 2015, the accomplished business revenue through contracted overseas engineering projects was 959.6 billion yuan, or 154.1 billion US dollars, up by 8.2 percent, and the number of labor forces sent abroad through overseas labor contracts was 530 thousand, down by 5.7 percent. The total freight traffic reached 41.7 billion tons, up by 0.2 percent over the previous year, and the freight flows were 17,740.1 billion ton-kilometers, down by 1.9 percent. The volume of freight handled by ports above the designated size throughout the year totaled 11.43 billion tons, up 1.6 percent over the previous year, of which freight for foreign trade was 3.59 billion tons, up 1.1 percent. Container shipping of ports above the designated size reached 209.59 million standard containers, up by 4.1 percent. In 2015, the total passenger traffic reached 19.4 billion persons, down by 4.4 percent over 2014, and the passenger flows were 3,004.7 billion person-kilometers, grew by 4.9 percent. The total number of motor vehicles for civilian use reached 172.28 million (including 9.55 million tri-wheel motor vehicles and low-speed trucks) by the end of 2015, up 11.5 percent, of which privately-owned vehicles numbered 143.99 million, up 14.4 percent. The total number of cars for civilian use stood at 95.08 million, up 14.6 percent, of which privately-owned cars numbered 87.93 million, up by 15.8 percent. The turnover of post and telecommunication services totaled 2,822.0 billion yuan, up 29.2 percent over the previous year. Of this total, post services amounted to 507.9 billion yuan, up 37.4 percent, and telecommunication services 2,314.2 billion yuan, up 27.5 percent. In post services, the number of mail delivery reached 4.58 billion, parcel delivery 40 million and express delivery 20.67 billion. The revenue from express delivery reached 277.0 billion yuan. In telecommunication services, the newly increased capacity of mobile phone switchboard was 65.29 million lines with the total capacity reaching 2,110.66 million lines. By the end of 2015, there were 1,536.73 million phone subscribers in China, of which 1,305.74 million were mobile phone users. Mobile phone coverage rose to 95.5 sets per 100 persons. The number of fixed broadband internet users reached 213.37 million, increased by 12.89 million over the previous year; while that of the mobile broadband users was 785.33 million, an increase of 202.79 million. Mobile internet traffic was 4.19 billion G, up 103 percent over the previous year. The number of Internet users was 688 million, grew by 39.51 million. Of the total, 620 million were mobile Internet surfers , an increase of 63.03 million. The coverage of Internet was 50.3 percent. Software revenue of software and IT services industry totaled 4,324.9 billion yuan, up 16.6 percent. The year 2015 registered 4 billion domestic tourists, up 10.5 percent over the previous year. The revenue from domestic tourism totaled 3,419.5 billion yuan, up 13.1 percent. The number of inbound visitors to China totaled 133.82 million, an increase of 4.1 percent. Of this total, 25.99 million were foreigners, down 1.4 percent; and 107.83 million were Chinese compatriots from Hong Kong, Macao and Taiwan, up by 5.6 percent. Of all the inbound tourists, overnight visitors counted 56.89 million, an increase of 2.3 percent. Earnings from international tourism topped 113.7 billion US dollars, up 7.8 percent. The number of China’s outbound visitors totaled 127.86 million, up 9.7 percent. Of this total, 121.72 million were on private visits, a year-on-year rise of 10.6 percent; and 85.88 million visited Hong Kong, Macao and Taiwan, up by 4.4 percent. By the end of 2015, money supply of broad sense (M2) was 139.2 trillion yuan, reflecting an increase of 13.3 percent. Money supply of narrow sense (M1) was 40.1 trillion yuan, up 15.2 percent. Cash in circulation (M0) was 6.3 trillion yuan, up 4.9 percent. In 2015, the increment of social financing reached 15.4 trillion yuan, decreased by 467.5 billion yuan over 2014 on a comparable basis. Savings deposit in Renminbi and foreign currencies in all items of financial institutions totaled 139.8 trillion yuan at the end of 2015, an increase of 15.3 trillion yuan. Of this total, the savings deposit in Renminbi stood at 135.7 trillion yuan, an increase of 15.0 trillion yuan. Loans in Renminbi and foreign currencies in all items of financial institutions reached 99.3 trillion yuan, an increase of 11.7 trillion yuan. Of this total, loans in Renminbi were 94.0 trillion yuan, an increase of 11.7 trillion yuan. Loans in Renminbi from rural financial institutions (rural credit cooperatives, rural cooperation banks and rural commercial banks) totaled 12,032.1 billion yuan by the end of 2015, an increase of 1,343.3 billion yuan as compared with the beginning of the year. The loans in Renminbi for consumption use from all financial institutions totaled 18,952.0 billion yuan, an increase of 3,586.9 billion yuan. Of all consumption loans, short-term loans for individuals totaled 4,100.8 billion yuan, an increase of 849.7 billion yuan, and medium- and long-term loans for individuals reached 14,851.2 billion yuan, an increase of 2,737.3 billion yuan. Funds raised in 2015 by enterprises through issuing stocks and share rights on stock market amounted to 2,981.4 billion yuan, an increase of 2,141.7 billion yuan from the previous year. Of this total, 220 A-shares were issued, receiving 157.9 billion yuan worth of capital altogether. The refinancing of A-shares (including right issued, public newly issued, nonpublic newly issued and warrants) received 671.1 billion yuan worth of capital, an increase of 254.6 billion yuan from 2014. The listed companies financed 2,152.4 billion yuan through convertible bonds, bonds with attached warrants, corporate bonds and SME private placement bonds, an increase of 1,796.1 billion yuan. There were 86 IPOs on the growth enterprise market in 2015 with 30.9 billion yuan raised. In 2015, 6.72 trillion yuan corporate debenture bonds were issued, an increase of 1.57 trillion yuan over the previous year. The premium received by the insurance companies totaled 2,428.3 billion yuan in 2015, up 20.0 percent over the previous year. Of this total, life insurance premium amounted to 1,324.2 billion yuan, health and casualty insurance premium 304.6 billion yuan, and property insurance premium 799.5 billion yuan. Insurance companies paid an indemnity worth of 867.4 billion yuan, of which, life insurance indemnity was 356.5 billion yuan, health and casualty insurance indemnity 91.5 billion yuan, and property insurance indemnity 419.4 billion yuan. In 2015, the national per capita disposable income was 21,966 yuan, an increase of 8.9 percent or a real increase of 7.4 percent after deducting price factors. 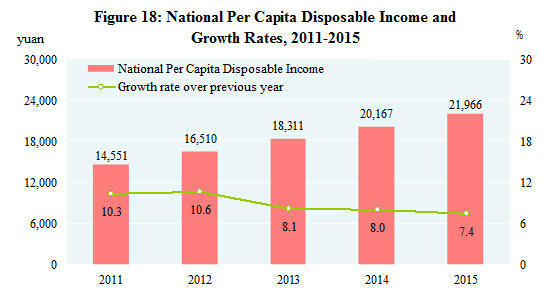 The median of national per capita disposable income was 19,281 yuan, up 9.7 percent. In terms of permanent residence, the per capita disposable income of urban households was 31,195 yuan, up by 8.2 percent, or a real growth of 6.6 percent after deducting price factors. The median of per capita disposable income of urban households was 29,129 yuan, up by 9.4 percent. The per capita disposable income of rural households was 11,422 yuan, up by 8.9 percent, or 7.5 percent in real terms. The median of per capita disposable income of rural households was 10,291 yuan, up by 8.4 percent. In 2015, the annual per capita net income of rural households was 10,772 yuan. The monthly per capita income of migrant workers was 3,072 yuan, increased by 7.2 percent. 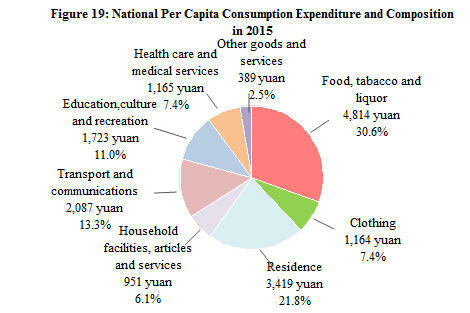 The national per capita consumption expenditure was 15,712 yuan, up by 8.4 percent, or a real growth of 6.9 percent after deducting price factors. In terms of permanent residence, the per capita consumption expenditure of urban households was 21,392 yuan, up by 7.1 percent, or 5.5 percent in real terms. The per capita consumption expenditure of rural households was 9,223 yuan, up by 10.0 percent, or a real growth of 8.6 percent after deducting price factors. By the end of 2015, a total of 353.61 million people participated in urban basic pension program for staff and workers, a year-on-year increase of 12.36 million. A total of 504.72 million people participated in basic pension insurance program for urban and rural residents, an increase of 3.65 million. A total of 665.70 million people participated in basic health insurance program, an increase of 68.23 million, of whom, 288.94 million people participated in basic health insurance program for staff and workers, a year-on-year increase of 5.98 million, and 376.75 million people participated in programs for residents, an increase of 62.25 million. Some 173.26 million people participated in unemployment insurance programs, an increase of 2.83 million. The number of people receiving unemployment insurance payment stood at 2.27 million. A total of 214.04 million people participated in work accident insurance, an increase of 7.65 million, of whom 74.89 million were migrant workers, an increase of 1.27 million. A total of 177.69 million people participated in maternity insurance programs, an increase of 7.30 million. Minimum living allowances were granted to 17.080 million urban residents and 49.032 million rural residents, and 5.175 million rural residents received five-guarantees supporting . A total of 59.103 million needy people in urban and rural areas were financed to participate in basic medical insurance system. According to the rural poverty line of annual per capita income of 2,300 yuan (at 2010 constant prices), the population in poverty in rural areas numbered 55.75 million in 2015, or 14.42 million less than that in 2014. In 2015, the post-graduate education enrollment was 1.911 million students with 645 thousand new students and 552 thousand graduates. The general tertiary education enrollment was 26.253 million students with 7.378 million new students and 6.809 million graduates. Vocational secondary schools had 16.567 million enrolled students, including 6.012 million new entrants, and 5.679 million graduates. Senior secondary schools had 23.744 million enrolled students, including 7.966 million new entrants, and 7.976 million graduates. Students enrolled in junior secondary schools totaled 43.120 million, including 14.110 million new entrants, and 14.176 million graduates. The country had a primary education enrollment of 96.922 million students, including 17.290 million new entrants, and 14.372 million graduates. There were 442 thousand students enrolled in special education schools, with 83 thousand new entrants and 53 thousand graduates. Kindergartens accommodated 42.648 million children. The number of students graduating from compulsory education reached 93.0 percent of the total enrollment and the gross enrollment rate in senior high schools reached 87.0 percent. 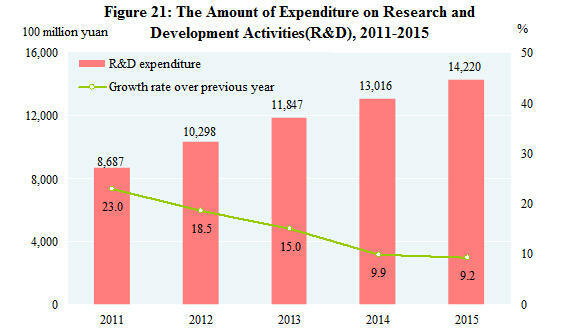 Expenditures on research and development activities (R&D) was worth 1,422.0 billion yuan in 2015, up 9.2 percent over 2014, accounting for 2.10 percent of GDP. Of this total, 67.1 billion yuan was appropriated for fundamental research programs. A total number of 3,574 projects under the National Key Technology Research and Development Program and 2,561 projects under the Hi-tech Research and Development Program (the 863 Program) were implemented. By the end of 2015, there were altogether 132 national engineering research centers and 158 national engineering laboratories. The number of state validated enterprise technical centers reached 1,187. Accumulatively, 206 venture investment enterprises were established under the support of State Venture Capital Investment Plans for Emerging Industries, with a total fund size approaching 55.7 billion yuan, and an investment to 1,233 venture businesses. Some 2,799 thousand patent applications were accepted from home and abroad, and a total of 1,718 thousand patents were authorized. Till the end of year 2015, the number of patents in force was 5.478 million, of which 872 thousand were invention patents from home. The number of invention patents per 10,000 people was 6.3. A total of 307 thousand technology transfer contracts were signed, representing 983.5 billion yuan in value, up 14.7 percent over the previous year. The year 2015 saw 19 times of successful launch of satellites. New models of carrier rockets, Long March-6 and Long March-11, succeeded in their first trip. Gaofen-4, the most sophisticated HD geosynchronous orbit remote sensing satellite, was successfully launched. Four Beidou new-generation navigation satellites were launched and the global network of Beidou satellite navigation system achieved steady progress. The country’s first home-made large passenger aircraft, the C919, rolled off the final assembly line. By the end of 2015, there were altogether 31,768 laboratories for product inspection, including 641 national inspection centers. There were 221 agencies for product quality and management system certification, which accumulatively certified products in 136,780 enterprises. There were 3,830 authorized measurement institutions in the year, enforcing compulsory inspection on 73.54 million measurement instruments. A total of 1,931 national standards were developed or revised in the year, including 1,330 new standards. 5,939 weather warning signals and 6,107 alerts were issued by national and provincial meteorological centers in 2015. There were 1,687 seismological monitor stations and 32 regional seismological monitor network stations. The number of oceanic observation stations (points) was 124. Mapping and geographic information departments published 2,003 maps. At the end of 2015, there were 2,052 art-performing groups and 2,956 museums in the cultural system throughout China. A total of 3,136 public libraries received 583.39 million people. There were 3,315 culture centers. Subscribers to cable television programs and digital cable television programs numbered 239 million and 202 million respectively. Radio broadcasting and television broadcasting coverage rates were 98.2 percent and 98.8 percent respectively. Totally 16,560 episodes of 395 TV series and 134,011 minutes of TV cartoons were made in 2015. The country produced 686 feature movies and 202 science, educational, documentary, cartoon and special movies . A total of 44.0 billion copies of newspapers and 3.0 billion copies of magazines were issued, and 8.1 billion copies of books were published. The average number of books possessed per person was 5.91 copies. By the end of the year, there were 4,196 archives in China and 132.94 million documents were made accessible to the public. In 2015, Chinese athletes won 127 world championships on 25 sports events and broke 12 world records. Chinese physically-challenged athletes won 395 world championships in 34 international sports competitions. By the end of 2015, there were 990,248 medical and health institutions in China, including 27,215 hospitals, 36,869 township health centers, 34,588 community health service centers, 195,866 clinics, 644,751 village clinics, 3,492 epidemic disease prevention centers and 3,097 health monitoring institutions. 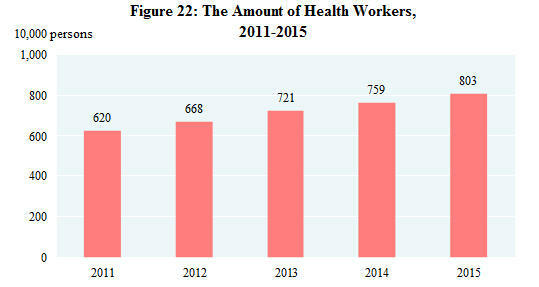 There were 8.03 million health workers in China, including 3.00 million practicing doctors and assistant practicing doctors and 3.28 million registered nurses. The medical and health institutions in China possessed 7.08 million beds, of which, hospitals possessed 5.34 million and township health centers had 1.21 million. By the end of 2015, there were altogether 32 thousand social welfare institutions providing accommodation, of which 28 thousand were elder-caring organizations. The social welfare institutions provided 6.763 million beds , and 6.698 million of them were for old-age caring. There were 24 thousand community service centers and 125 thousand community service stations. In 2015, the total supply of state-owned land for construction use was 530 thousand hectares, a decrease of 12.5 percent over the previous year. Of this total, the supply for mining storage was 120 thousand hectares, down by 15.2 percent; that for real estate was 120 thousand hectares, down by 20.9 percent; and that for infrastructure facilities was 290 thousand hectares, down by 7.1 percent. The total stock of water resources in 2015 was 2,830.6 billion cubic meters. The annual average precipitation was 644 millimeters. At the end of 2015, the 614 large reservoirs covered by monitoring program in China stored 364.5 billion cubic meters of water, almost the same as that in the last year. With an increase of 1.4 percent over 2014, the total water consumption reached 618.0 billion cubic meters, of which water consumption for living purposes rose by 3.1 percent, for industrial use increased by 1.8 percent, for agricultural use up by 0.9 percent, and for ecological water supplement grew by 1.7 percent. Water consumption for every 10 thousand yuan worth of GDP produced was 104 cubic meters, a decline of 5.1 percent over the previous year. Water consumption for every 10 thousand yuan worth of industrial value added was 58 cubic meters, down by 3.9 percent. Per capita water consumption was 450 cubic meters, up by 0.9 percent. In 2015, a total of 6.32 million hectares of forests were planted, of which 2.42 million hectares were afforested through key afforestation projects, accounting for 38.2 percent of the total planted area of the year. By the end of 2015, there were 2,740 natural reserves including 428 national ones. A total of 54 thousand square kilometers of eroded land was put under treatment programs, and 20 thousand square kilometers of land was closed for nurture and protection in areas suffering water and soil erosion. The average temperature in 2015 was 10.5℃. Typhoon hit China 6 times in 2015. Preliminary estimation indicated that the total energy consumption in 2015 amounted to 4.30 billion tons of standard coal equivalent, up 0.9 percent over 2014. The consumption of coal declined by 3.7 percent; crude oil, up 5.6 percent; natural gas, up 3.3 percent; and electric power, up 0.5 percent. The consumption of coal accounted for 64.0 percent of the total energy consumption, while clean energy consumption, such as hydropower, wind power, nuclear power and natural gas, accounted for 17.9 percent. 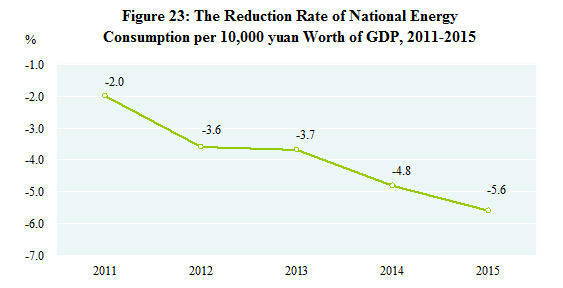 The national energy consumption per 10,000 yuan worth of GDP went down by 5.6 percent. The comprehensive energy consumption per ton crude copper of industrial enterprises went down by 0.79 percent year-on-year, that of per ton steel declined by 0.56 percent, per unit caustic soda, down by 1.41 percent, and per ton cement, down by 0.49 percent. 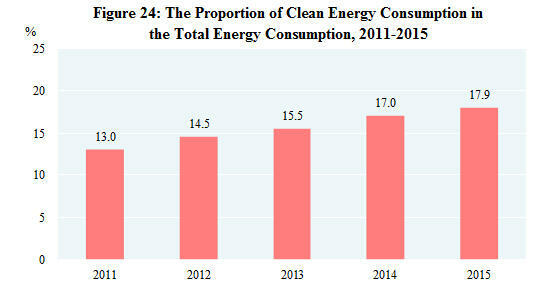 The standard coal consumption per kilowatt-hour of thermal power generation was decreased by 0.95 percent. Monitoring of water quality on 700 sections of the 10 major river basins in China showed that 72.1 percent of the sections met the national quality standard from Grade I to Grade III for surface water; and 8.9 percent were worse than Grade V. Generally, the water quality in the 10 major basins maintained stable with slight pollution. Monitoring of oceanic water quality at 301 offshore monitoring stations indicated that oceanic water met the national quality standard Grade I and II in 70.4 percent of the stations; water quality at 7.6 percent of the stations met Grade III standard; and water of Grade IV or inferior quality was found at 21.9 percent of the stations. Of the 338 cities monitored, 21.6 percent reached the air standard and 78.4 percent failed. Of the 321 cities subject to noise monitoring program, 4.0 percent enjoyed fairly good environment, 68.5 percent had good environment, 26.2 percent had fair environment, 0.9 percent had poor environment and 0.3 percent had bad environment in downtown areas. At the end of 2015, the daily treatment capacity of city sewage reached 137.84 million cubic meters, up 5.3 percent over that at the end of 2014. City sewage treatment rate was 91.0 percent, up 0.8 percentage point. 92.5% of municipal solid waste was treated without causing pollution, up 0.7 percentage point. The floor space with central heating systems in urban area amounted to 6.42 billion square meters, up 5.1 percent. The green area totaled 1.89 million hectares in urban built-up area, increased by 3.7 percent. Greenery coverage reached 36.3 percent of built-up area, up 0.05 percentage point. Per capita green area of parks reached 13.16 square meters, an increase of 0.08 square meter. In 2015, natural disasters hit 21.77 million hectares of crops, of which 2.23 million hectares of crops were demolished. Flood and waterlog caused a direct economic loss of 92.0 billion yuan. Drought caused a direct economic loss of 48.6 billion yuan. Disasters from low temperature, frost and snow made a total direct economic loss of 8.9 billion yuan. Oceanic disasters caused a direct economic loss of 7.2 billion yuan. The country recorded 14 earthquakes with magnitude 5 and over, 12 of which caused disasters, causing a direct economic loss of 18.0 billion yuan. The year 2015 witnessed 2,936 forest fires, with 13 thousand hectares of forests damaged. The death toll due to work accidents amounted to 66,182 people. The death toll from work accidents for every 100 million yuan worth of GDP was 0.098 people, a decline of 8.4 percent. Work accidents in industrial, mining and commercial enterprises caused 1.071 deaths out of every 100 thousand employees, down 19.4 percent. The road traffic death toll per 10 thousand vehicles was 2.10 persons, down 4.5 percent. The death toll for one million tons of coal produced in coalmines was 0.162 person, down 36.5 percent. 2. Gross domestic product (GDP), value added and per capita GDP as quoted in this Communiqué are calculated at current prices whereas their growth rates are at constant prices. 3. Gross national income, also known as Gross National Product, refers to the final result of the primary distribution of the income created by all the resident units of a country (or a region) during a certain period of time. It equals to Gross Domestic Product plus the net factor income from abroad. 4. Population who live in places other than their household registration refers to those who reside in areas other than their household registration and have been away from there for over 6 months. 5. Floating population refers to the population who live in places other than their household registration excluding those with current residence different from the place of their household registration but still in the same city. Population who live in places other than their household registration but still in the same city refer to those whose current residences are different from the registered towns or streets in the same district or in different districts but still in the same municipality or prefecture-level city. 6. By the end of 2015, the population between 0 to 14 (including those not yet reaching the age of 15) were 227.15 million and that between 15 to 59 (including those not yet reaching the age of 60) were 925.47 million. 7. The number of migrant workers includes those who are employed outside their villages and towns for more than six months in the year and those who do non-agricultural work in their villages and towns for more than six months in the year. 8. The overall labor productivity refers to the ratio between the GPD (at 2010 constant price) and the total number of persons employed. 9. The producer prices for farm products refer to the prices of farm products sold directly by producers. 10. The housing prices include prices for construction and decoration, rent, owner-occupied housing, water, electricity and fuel etc. 11. According to the requirement to improve the government budget system, 11 funds of the government fund to provide fundamental public services and for the staff and organization operation etc. were listed as general public budget. Therefore, the effect of relisting the 11 government funds as general public budget has to be removed to calculate the growth rate of the indicator of the same coverage. 12. The six major high energy consuming industries include processing of petroleum, coking and processing of nuclear fuel, manufacture of raw chemical materials and chemical products, manufacture of non-metallic mineral products, smelting and pressing of ferrous metals, smelting and pressing of non-ferrous metals and production and supply of electricity and heat power. 13. High technology manufacturing industry includes manufacture of medicine, manufacture of aerospace vehicle and equipment, manufacture of electronic and communication equipment, manufacture of computers and office equipment, manufacture of medical equipment, manufacture of measuring instrument and equipment and manufacture of optical and photographic equipment. 14. Manufacturing of equipment include manufacturing of metal products, general purpose equipment, special purpose equipment, automobiles, railway, ship, aerospace and other transport equipment, electrical machinery and apparatus, computers, communication and other electric equipment and measuring instrument and machinery. 15. Natural gas includes natural gas from gas fields, natural gas from oil fields (gas from oil fields gas zones and dissolved gas associated with oil fields) and natural gas from coal mines (also known as coal bed gas). 16. The data include 344.00 million tons of steel which has been reprocessed among enterprises. 17. A few installed power generation capacity was not listed (e.g. geothermal). 18. The national total of fixed assets investment is larger than the aggregate sum by adding up the subtotals of fixed assets investment in the eastern areas, central areas, western areas and northeastern areas due to the fact that some of the trans-regional investments are not covered by regional figures. The eastern areas include 10 provinces and municipalities: Beijing, Tianjin, Hebei, Shanghai, Jiangsu, Zhejiang, Fujian, Shandong, Guangdong and Hainan; the central areas cover 6 provinces: Shanxi, Anhui, Jiangxi, Henan, Hubei and Hunan; the western areas include 12 provinces, autonomous regions and municipality: Inner Mongolia, Guangxi, Chongqing, Sichuan, Guizhou, Yunnan, Tibet, Shaanxi, Gansu, Qinghai, Ningxia and Xinjiang; the northeastern areas include 3 provinces: Liaoning, Jilin and Heilongjiang. 19. Investment in infrastructure refers to the investment in the construction or purchase of fundamental, public-serving projects and facilities for the social production and people’s life, including transportation, postal service, telecommunication, radio, TV and satellite transmission, internet and related services, management of water conservancy, environment and public facilities. 20. Private investment in fixed assets refers to investment in the construction or purchase of fixed assets by domestic collective, private and individual-owned enterprises or organizations or their holding enterprises (with absolute holding and relative holding enterprises). 21. Investment in high technology industries refers to investment in six high technology manufacturing industries, including the manufacture of medicine and manufacture of aerospace vehicle and equipment, and nine high technology service industries, including information service and e-commerce service. 22. The investment in real estate includes the investment made in real estate development, construction of buildings for own use, property management, intermediary services and other real estate development. 23. High-speed railways refer to railways with a highest operating speed of 200 km/h or above. 24. Online retail sales refer to the retail sales of goods and services realized through internet trading platforms (including self-built websites and third-party platforms). The sales of services of online retail and a few other goods for production operation and resale are not covered by the total retail sales of consumer goods. 25. Trade of goods and foreign investment absorbed are calculated in RMB term. Trade of services, overseas investment and contracted overseas engineering projects are still in US dollar term due to technical reasons. 26. The imports and exports of services are calculated according to the sixth edition of Balance of Payments and International Investment Position Manual (BPM6) and do not cover government services and the growth rate is calculated on a comparable basis. 27. The Belt and Road refer to the Silk Road Economic Belt and the 21st –century Maritime Silk Road. 28. Accounting method and statistical coverage of passenger traffic, freight traffic, passenger flow and freight flow of highways in 2015 have been changed. The growth rate was calculated on a comparable basis. 29. The turnover of post and telecommunication services is calculated at constant prices of 2010. 30. The capacity of mobile phone switchboard refers to the number of maximum concurrent users calculated by the mobile phone switchboard according to certain calling model and switchboard processing capacity. 31. Fixed broadband internet users refer to those who make registration in the telecommunication enterprises and access the internet through xDSL, FTTx+LAN, FTTH/0 and other broadband access ways as well as dedicated lines at the end of the reporting period. 32. Mobile broadband users refer to those who have records in the billing system and use 3G or 4G network resources at the end of the reporting period. 33. The number of mobile Internet surfer refers to the number of Chinese residents aged 6 and above who connected to and surfed on the Internet via mobile phones in the past six months. 34. Software and IT services industry includes software development, information system integration, IT consulting service, data processing and storage, integrated circuit design and other IT services industry. 35. The increment of social financing refers to the total funds raised by real economy from the financial system over a period of time. 36. Non-public new issue or targeted placement excludes assets subscription. 37. Corporate debenture bonds include debt financing instruments of non-financial businesses, enterprise bonds, corporate bonds and convertible bonds. 38. The original premium income received by the insurance companies refers to the premium income from original insurance contracts confirmed by the insurance companies. 39. The median of per capita income refers to the per capita income of household lied in the middle of all surveyed households which are ranked from low to high (or high to low) based on per capita income level. 40. Five-guarantees supporting in rural areas refers to villagers who are aged, disabled or under the age of 16 and have no ability to work, no source of income and no statutory obligors to provide for them, bring them up or support them, or whose statutory obligors have no ability to provide for them, bring them up or support them, shall enjoy life-care and physical care in terms of food, clothing, housing, medical care and funeral expenses. 41. Vocational secondary schools include regular specialized secondary schools, adult specialized secondary schools, vocational high schools and skilled workers schools. 42. State venture capital investment plan for emerging industries refers to the activities in which the central government special funds, together with the local government funds and social funds set up venture investment enterprises, or invest in the venture businesses in the form of equity investment to foster or promote the development of emerging industries. 43. Oceanic observation stations (points) refer to places relying on shores and islands (or fixed offshore platforms) to conduct marine hydrological and meteorological observations in order to obtain representative, fixed and continuous observation material of marine environment. Some oceanic observation stations have many observation points. 44. The people received by the public libraries refer to the number of people who visit libraries and use library services in the year, including borrowing and reading books, consultation and attending readers’ programs. 45. Special movies refers to those using different display modes in terms of projection techniques, equipment and program as compared with the ordinary cinemas, such as IMAX movies, 3D movies, 4D movies, multidimensional movies and full dome movies. 46. The average number of books possessed per person refers to the average number of books published in the year that can be possessed per person in China. 47. The beds provided by social welfare institutions include those provided by adoption agencies, aid agencies, community agencies, serviceman recreation habitation and military supply stations etc. 48. Total supply of state-owned land for construction use refers to the supply of state-owned land for construction use with the land-used right sold, allocated or leased to units or individuals by the municipal or county governments according to annual land supply plan and in line with relevant laws in the reporting period. 49. Land used for real estate refers to the sum of land used for commercial service and for residence. 50. The consumption of water and energy for producing 10 thousand yuan worth of GDP and water consumption for every 10 thousand yuan worth of industrial value added are calculated at 2010 constant prices. 51. Ten major river basins include the Yangtze River, Yellow River, Pearl River, Songhua River, Huaihe River, Haihe River, Liaohe River, rivers in Zhejiang and Fujian Provinces, rivers in Northwest China and rivers in Southwest China. In this Communiqué, data of newly increased employed people, unemployment rate through unemployment registration and social security are from the Ministry of Human Resources and Social Security; financial data are from the Ministry of Finance; data of foreign exchange reserves, exchange rate，monetary finance and corporate credit bonds are from People’s Bank of China; data of output of aquatic products are from the Ministry of Agriculture; data of production of timber, forestry and forest fires are from the State Forestry Administration; data of areas with effective irrigation system and water resources are from the Ministry of Water Resources; data of newly increased power generating capacity and newly increased power transformer equipment with a capacity of over 220 kilovolts are from China Electricity Council; data of new railways put into operation, double-track railways put into operation, electrified railways put into cooperation and railway transportation are from the Ministry of Railways; data of new highways, new cargo-handling capacity of berths for over 10000-tonnage ships, highway transportation, waterway transportation and volume of freight handled by ports are from the Ministry of Transport; data of new civil transportation airports and civil aviation are from the General Administration of Civil Aviation; data of new lines of optical-fiber cables, new capacity of phone switchboards, the number of phone users, mobile internet traffic, internet users and software revenue are from the Ministry of Industry and Information Technology; data of indemnificatory housing, treatment of city sewage, area with central heating systems and greenery coverage are from the Ministry of Housing and Urban-Rural Development; data of imports and exports of goods are from the General Administration of Customs; data of imports and exports of services, foreign direct investment, overseas direct investment, overseas contracted projects and overseas labor contracts are from the Ministry of Commerce; data of pipelines are from China National Petroleum Corporation, China Petrochemical Corporation and China National Offshore Oil Corporation; data of motor vehicles for civilian use and the road traffic death toll are from the Ministry of Public Security; data of post services are from the State Post Bureau; data of tourism are from the National Tourism Administration and the Ministry of Public Security; data of listed companies are from the China Securities Regulatory Commission; data of insurances are from China Insurance Regulatory Commission; data of urban and rural minimum living allowances, five-guarantees supporting, social services, areas of crops hit by natural disasters, direct economic loss caused by flood and waterlog, direct economic loss caused by drought, direct economic loss caused by low temperature, frost and snow are from the Ministry of Civil Affairs; data of education are from the Ministry of Education; data of national technology research and development program and technology transfer contracts are from the Ministry of Science and Technology; data of national engineering research centers, enterprise technical centers and venture capital investment for boosting new emerging industries are from the National Development and Reform Commission; data of patents are from the State Intellectual Property Office; data of satellite launch are from the State Administration of Science, Technology and Industry for National Defense; data of quality inspection, development and revision of national standards are from the General Administration of Quality Supervision, Inspection and Quarantine; data of weather warning, average temperature and typhoon are from the China Meteorological Administration; data of earthquakes are from the China Seismological Bureau; data of oceanic observation stations, direct economic loss caused by oceanic disasters are from the State Oceanic Administration; data of mapping are from the National Administration of Surveying, Mapping and Geo-information; data of art-performing groups, museums, public libraries and culture centers are from the Ministry of Culture; data of radio, television, movies, newspapers, magazines and books are from the State Administration of Press, Publication, Radio, Film and Television; data of documents are from the State Archives Administration; data of sports are from the General Administration of Sport; data of physically-challenged athletes are from the China Disabled Persons’ Federation; data of health are from the National Health and Family Planning Commission; data of supply of state-owned land for construction use are from the Ministry of Land and Resources; data of natural reserves and environment monitoring are from the Ministry of Environmental Protection; data of work safety are from the State Administration of Work Safety; all the other data are from the National Bureau of Statistics.